* (0:28) Dan and Julia’s Halloween costumes. 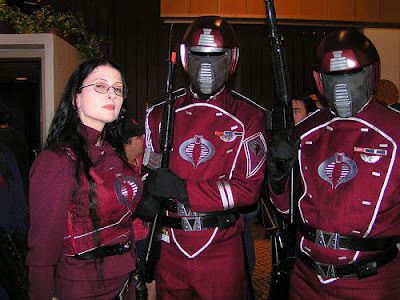 Cobra Crimson Guard. * (4:40) The Star Wars expanded universe. Yes, there really was a Star Wars movie with Wilford Brimley. * (9:57) The 1812 Overture, Lichtenstein, and other stuff on music. * (0:39) The buffalo sentence. * (2:00) Chad and Dan are really, really famous. Or at least random people seem to think so. * (7:15) A forbidden episode has been released on the forums. You can find it here. * (9:34) People that look only to their character sheets for answers to everything in a game. * (0:30) Granite and truth (though Dan got the phrase slightly wrong). * (2:28) Handling characters of faith that don’t follow any particular god or goddess. The role of game balance. Why such characters have been fairly rare in our experience. * (0:22) Introducing Derek from the THE ESTABLiSHED FACTS. * (2:20) Derek’s charity for Fear the Con 7. * (9:36) Derek’s overnight dungeon marathon. * (12:01) Pat’s Cinco de Mayo leads into a conversation about demystifying alcohol to children. * (16:54) How the heck did we get on this topic?